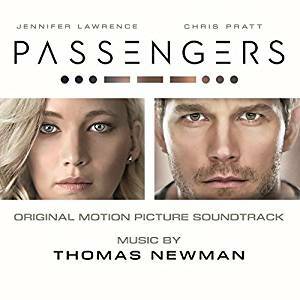 Sony Classical and Madison Gate Recordsproudly announce the release of Passengers (Original Motion Picture Soundtrack)featuring music by Thomas Newman. The soundtrack will be available Dec. 16. The Sci-Fi film Passengers will arrive in theatres Dec. 21. The Sci-Fi Adventure follows the spaceship "Starship Avalon" in its 120-year voyage to a distant colony planet known as the "Homestead Colony" when malfunctions occur in two of its sleep chambers. Jennifer Lawrence (The Hunger Games, American Hustle) and Chris Pratt(Zero Dark Thirty, The Magnificent Seven) are two passengers onboard a spaceship transporting them to a new life on the new planet. The trip takes a deadly turn when their hibernation pods mysteriously wake them 90 years before they reach their destination. As their characters Jim and Aurora try to unravel the mystery behind the malfunction, they begin to fall for each other, unable to deny their intense attraction only to be threatened by the imminent collapse of the ship and the discovery of the truth behind why they woke up. Passengers is directed by the Morten Tyldum, director of The Imitation Game. For updates, please visit facebook.com/PassengersDerFilm/ and @passengersmovie. Thomas Newman is an American film score composer and a member of a family who established a film-scoring dynasty in Hollywood. He was born in Los Angeles, California, the youngest son of composer Alfred Newman (1901-1970). Newman has received a total of thirteen Academy Award™ nominations. He has won two BAFTAs, six Grammys™ and an Emmy™, and has been nominated for three Golden Globes™. Newman was honored with the Richard Kirk award at the 2000 BMI Film and TV Awards. The award is given annually to a composer who has made significant contributions to film and television music. One of the most interesting things about Newman is his change of styles, beginning with his score for American Beauty, which received critical acclaim. Before this, Newman gravitated more towards the orchestra for his music, like in most other film music. However, in American Beauty his fans witnessed his take on a minimalistic score with an array of odd instruments and a rhythmic style. Since then Newman has alternated and mixed in both his traditional sweeping orchestral scores along with his new, creative style. He is notorious among score listeners for using plenty of instruments the average listener would never have heard of. Among his most recent compositions are James Bond 007: Skyfall (2012), Side Effects (2013), Bridge of Spies (2015), and James Bond 007: Spectre (2015).